This book presents educators with research-based strategies to promote civic education in their classrooms. Going beyond theory and measures of achievement, these methods focus on information location, evaluation and activation, dialogue in the classroom, understandings of discourse in popular culture and policymaking, and understanding the role of STEM disciplines in democracy. The author also furthers considerations of how the political process can provide meaning and new visions of justice in a globalized world, and advance student leadership and academic writing in the information age. As the world faces unprecedented levels of poverty, wealth disparity, environmental destruction, and ethical questions regarding biotechnology, the United States needs knowledgeable citizens to effectively deal with these issues. Letizia provides teachers and teacher educators with the needed methods to foster these types of democratic considerations. This book constructs a deepening, interdisciplinary understanding of adult learning and imaginatively reframes its transformative aspects. The authors explore the tension at the heart of current understanding of 'transformative' adult learning: that while it can be framed as both easy and imperative, personal transformation is in fact rooted in the context in which we live, our stories and relationships. At its core, transformation is never easy - nor always desirable - and the authors thus draw on interdisciplinary and auto/biographical inquiry to explore what it means to change our presuppositions and frames of meaning that guide our thinking. Using their linguistic, gendered, academic and cultural differences, the authors illuminate how the social, contextual, cultural, cognitive and psychological dimensions of transformation intertwine. In doing so, they emphasise the importance of transformation as a contingent struggle for meaning and recognition, social justice, fraternity, and the pursuit of truth. This engaging book will be of interest to students and scholars of transformative learning and education. This book extends the national discussion about the Professional Development School (PDS) movement of the past three decades. The volume highlights school/university partnerships' focus on collaborative activities that endeavor to promote social justice in and across P-12 and university classrooms, educational institutions, and communities. Professional Development Schools and Social Justice: Schools and Universities Partnering to Make a Difference guides veteran teachers, undergraduate and graduate pre-service teachers, and university faculty to understand how the PDS model might be oriented toward social justice ideals. Co-authored by school- and university-based educators, each chapter details the social justice work of specific partnerships and provides concrete instructional and curricular methods for application within both teacher education and PK-12 settings. Readers are provided insight into a range of elements of Professional Development Schools, including the development of PK-12 and teacher education curricula, processes of program implementation, and research and data collection. This volume explores teacher and librarian partnerships in literacy education, showing that such partnerships are essential to literacy education in 21st century. Teacher and librarian partnerships contribute significantly to the realization of the democratic mandate of the teaching and library profession. Partnerships respond to the educational challenges characterized by an unprecedented pace of knowledge development, digitalization, globalization and extensive transnational migration. The contributors reconceptualize literacy education based on teacher and librarian partnerships. Studies from Sweden, Norway and the U.K. analyze such partnerships as sociocultural and intercultural practices, documenting ways in which teacher and librarian partnerships in literacy education enhance reading literacy, learning, empowerment and social justice. The authors treat literacies as social practices, rather than as an autonomous skill, working with interdisciplinary perspectives that draw on educational research, New Literacy Studies, library and information science and interprofessional studies. Partnerships facilitate reading for pleasure and reading engagement in work with school subjects and curriculum goals, irrespective of socio-economic or cultural background or gender. The partnerships facilitate work with multimodal literacies and inquiry-based learning, both of which are essential in the 21st century. Equally important, the contributors show that the partnerships foster work with the multiple literacies of students and communities, and students' attachment to the public and school library. The contributors also analyze tensions and contradictions in literacy education and in school library policy and practice, and attempt to deal with these challenges. Teacher and Librarian Partnerships in Literacy Education in the 21st Century brings together leading scholars in educational research and literacy studies, including Brian V. Street, Teresa Cremin, Joan Swann and Joron Pihl. The volume addresses scholars, and is relevant for students, teachers, librarians and politicians. This book promotes the idea that professionalism among teachers should be marked by democratic relations, rather than by managerialism and performance management. It provides a thorough investigation of issues around the participation of trainee teachers in the Lifelong Learning Sector, by reflecting on their experiences and questioning how well initial teacher education prepares teachers as professional practitioners in the sector. The reflexive nature of the book promotes a deep discussion of the nature of professionalism, drawing upon the works of John Dewey, Michel Foucault and Pierre Bourdieu, and places initial teacher education in the Lifelong Learning Sector firmly within the policy and ideological context of regulation, audit and control. It also illuminates pertinent discussions around teacher agency through a consideration of confidence, excellence, and routinised practices. Finally, the book takes us 'through the looking glass' to reveal the tensions within the teacher education curriculum as it prepares trainee teachers for a ready-made world, whilst at the same time attempting to encourage principles of social justice, inclusive practice and education as a democratic endeavour. It will be compelling reading for students and researchers working in Education and Sociology, particularly those with an interest in lifelong learning and teacher training. 'This is a very exciting book and should be read widely by anyone who wants a better understanding of the role of assessment in the diverse, globalised, digital societies of the 21st century.' - Professor Mary James, University of Cambridge, President, British Educational Research Association 'Highly readable and thoroughly researched, this call for a new vision of education deserves to be ready by all those who share the concern to shape today's assessment practices to meet the needs of tomorrow's society.' - Professor Patricia Broadfoot, CBE, University of Bristol Do you need a practical guide to assessment, curriculum and policy? Are you also looking for a book that is firmly grounded in theory and professional practice? This book makes assessment processes transparent for practitioners, and shows how assessment should align with curriculum and teaching for success in education. The book will show you how practitioner use of achievement standards can improve learning, equity, social justice and accountability. Inside this book, you will learn about: * Quality assessment and judgement practice * Relationships across curriculum, assessment, teaching and learning * Front-ending assessment based on the learner's needs * Practitioner judgement approaches and standards * The conditions under which teacher assessment can be valid * Principles derived from research of social moderation practices Assessment for Education is the perfect guide for students, researchers, academics and teaches, and anyone working in curriculum and assessment policy. This accessible and compelling collection of§faculty reflections examines the tensions between the arts and academics and§offers interdisciplinary alternatives for higher education. With an eye to§teacher training, these artist scholars share insights, models, and personal§experience that will engage and inspire educators in a range of post-secondary§settings. The authors represent a variety of art forms, perspectives, and§purposes for arts inclusive learning ranging from studio work to classroom§teaching to urban settings in which the subject is equity and social justice.§From the struggles of an arts concentrator at an Ivy League college to the§challenge of reconciling the dual identities as artists and arts educators, the§issues at hand are candid and compelling. The examples of discourse ranging§from the broad stage of arts advocacy to an individual course or program give§testimony to the power and promise of the arts in higher education. During the past twenty years, the world's most renowned critical theorist--the scholar who defined the field of postcolonial studies--has experienced a radical reorientation in her thinking. Finding the neat polarities of tradition and modernity, colonial and postcolonial, no longer sufficient for interpreting the globalized present, she turns elsewhere to make her central argument: that aesthetic education is the last available instrument for implementing global justice and democracy. 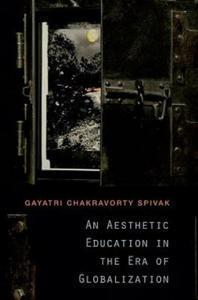 Spivak's unwillingness to sacrifice the ethical in the name of the aesthetic, or to sacrifice the aesthetic in grappling with the political, makes her task formidable. As she wrestles with these fraught relationships, she rewrites Friedrich Schiller's concept of play as double bind, reading Gregory Bateson with Gramsci as she negotiates Immanuel Kant, while in dialogue with her teacher Paul de Man. Among the concerns Spivak addresses is this: Are we ready to forfeit the wealth of the world's languages in the name of global communication? "Even a good globalization (the failed dream of socialism) requires the uniformity which the diversity of mother-tongues must challenge," Spivak writes. "The tower of Babel is our refuge." In essays on theory, translation, Marxism, gender, and world literature, and on writers such as Assia Djebar, J. M. Coetzee, and Rabindranath Tagore, Spivak argues for the social urgency of the humanities and renews the case for literary studies, imprisoned in the corporate university. "Perhaps," she writes, "the literary can still do something."